Ali G is taking on the NBA. That' s right everyones favorite gangsta rapper/interviewer is taking on the likes of Kobe Bryant, Steve Nash and the whole NBA. 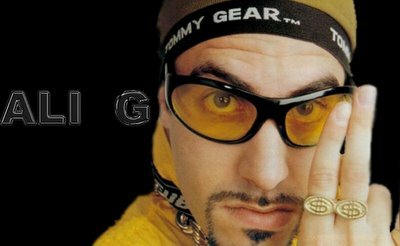 Ali G doesn't seem to know to much about basketball but he knows a lot about funny. The look on Kobe's face when he asked. "how many springs are in the ball," is priceless. Check out all the video clips right here. And watch the NBA on TNT, Thursdays.